In many communities across the country, Emergency Medical Services (EMS) provide preventative health care to help reduce unnecessary and costly trips to the emergency room and ensuing hospital admissions. EMS operating in a Mobile Integrated Health (MIH) role help patients with chronic conditions in their homes, divert ambulance calls to outpatient providers, and in some communities, use telemedicine to connect their patients with physicians from their homes. But what if a disaster should strike? How might MIH providers best assist in the response effort? A recent study1 was the first to examine the work of MIH providers — Richland County (South Carolina) EMS — during an October 2015 response to severe flooding. Alternative housing or social services. Transportation to relocate them with family outside of the affected area. Readily identifying to local authorities those patients who required in-person wellness checks. Delivering food and water to patients they knew were unable to leave their homes due to a disability. Providing uninterrupted power supply for home ventilators, left ventricular assist devices, and other medical equipment. EMS physicians augmented MIH services during the flood response by performing telephone triage and self-care instruction to patients cut off from EMS. They responded to the field and provided consultation to MIH as needed. Include disaster response in the MIH training curriculum. Help patients prepare for disasters by emphasizing the need for an evacuation plan and to safeguard adequate supplies of medications and durable medical equipment. Identify ahead of time community members with complex medical needs, such as people who require access to uninterrupted power for life-sustaining medical equipment. 1Gainey C., Brown H., Gerard W. (2018). Utilization of Mobile Integrated Health Providers During a Flood Disaster in South Carolina. Prehospital and disaster medicine: 33(4), 432-435. “When Atrium Health’s mobile hospital unit arrived into Burgaw, N.C., on Tuesday from its home-base in Charlotte, residents of the rural area had been without medical care for days in the wake of Hurricane Florence. They lined up for help even as the medical team was setting up in a Family Dollar parking lot. The area’s Pender Memorial Hospital, a critical access hospital, was evacuated ahead of the storm and remained closed because of flooding. The nearest open hospital sat at least 50 miles to the south in Wilmington, N.C., a city unreachable by ground transportation after rising floodwaters cut if off from the rest of the state. Within 18 hours Atrium Health’s Med-1 mobile hospital team of 32 physicians, nurses and other clinicians had treated more than 50 patients, many with chronic diseases, such as heart disease or diabetes. Their conditions had been exacerbated by the stress of the hurricane, loss of electricity or homes and the lack of medical care. Others suffered minor injuries that turned major after becoming infected by unclean water and debris…..Hospitals prepared extensively for the hurricane by stocking up on fuel, water, food and medical supplies as part of emergency plans that had been tested and honed by past disasters. Many had evacuated patients well enough to be moved to make room for the injured they expected to see after the storm. The Fire Brigades Union is demanding more money for its members before it agrees they should be called upon to rescue casualties from the scene of a massacre. A militant trade union has been accused of blocking Government plans for more firefighters to respond to terrorist attacks. Deadlock in the long-running dispute means fire brigades are having to rely on volunteers and senior officers to man the specialist teams that are on standby to tackle Marauding Terrorist Firearms Attacks (MTFA). Fire brigades were first asked to set up specialist teams to help respond to terror attacks in 2011 and there are currently 15 around England. They are on call round the clock and equipped with stretchers so they can carry the injured out of the ‘warm zone’ where a terror attack has taken place and into safety, where paramedics can treat them. But because there has been no agreement with the FBU to make it a contractual requirement, all those who take part are volunteers and in some brigades only senior officers or non-union members are on the teams. Last year, the FBU advised its members there was ‘no obligation’ for them to take part in any training exercises for terror attack response. Lord Harris of Haringey, who investigated London’s preparedness for a terror attack, urged the Home Office and the FBU to resolve the issue. • The Greater Manchester fire and rescue service did not arrive at the scene and therefore played “no meaningful role” in the response to the attack for nearly two hours. • A “catastrophic failure” by Vodafone seriously hampered the set-up of a casualty bureau to collate information on the missing and injured, causing significant distress to families as they searched for loved ones and overwhelming call handlers at Greater Manchester police. • Complaints about the media include photographers who took pictures of bereaved relatives through a window as the death of their loved ones was being confirmed, and a reporter who passed biscuit tin up to a hospital ward containing a note offering £2,000 for information about the injured. • A shortage of stretchers and first aid kits led to casualties being carried out of the Arena on advertising boards and railings. • Armed police patrolling the building dropped off their own first aid kits as they secured the area. • Children affected by the attack had to wait eight months for mental health support. Department of Homeland Security: Austere Emergency Medical Support Field Guide. A fire swept through Sejong Hospital in southeastern South Korea on Friday, killing more than 30 people and injuring over 80. Operation LENTUS is the Canadian Armed Forces (CAF) contingency plan that outlines the joint response to provide support for Humanitarian Assistance and Disaster Response (HADR) to provincial and territorial authorities in the case of a major natural disaster that overwhelms their capacity to respond. Support to civilian authorities during a crisis such as a natural disaster is one of the six core missions of the CAF identified in the Canada First Defence Strategy. to stabilize the natural disaster situation. In addition, specialized abilities such as engineering, health services, force protection, transport, aviation or logistics may also be employed. Once tasked, Canadian Joint Operations Command coordinates the personnel, vehicles, equipment, crews and aircraft to be employed in the region affected by the disaster, in coordination with the respective regional joint task force. BBC: A breakdown in communication led to a near two-hour delay in sending fire crews to the scene of the Manchester Arena attack on May 22. 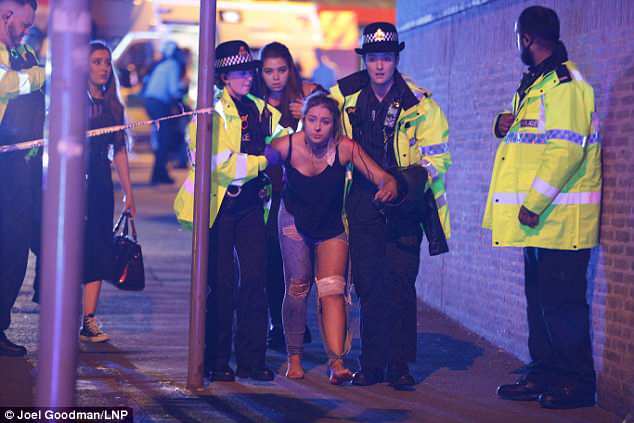 Fire crews were deployed to the Ariana Grande gig 1 hour 47 minutes after Salman Abedi killed 22 and injured 512. “…..Weber said the green-tagged patients had minor injuries, the yellow-tagged patients had non-life-threatening injuries, and those with red tags needed to be transported to the hospital immediately. The black-tagged individuals were expected to die. Weber said patients were growing more desperate on their second round of pickups.